Congratulations to 2018 graduate William Houlahan. 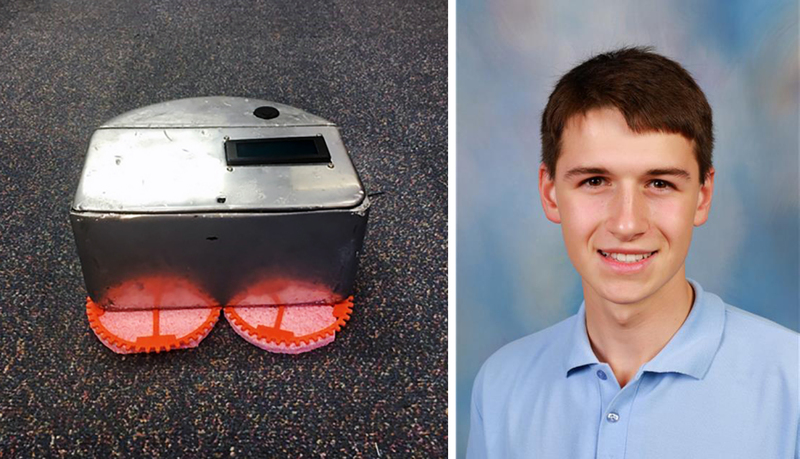 Will studied Systems Engineering for his VCE (Victorian Certificate of Education) and has been selected to have his work from 2018 exhibited in this year’s Top Designs exhibition as part of the VCE Season of Excellence 2019. Will is one of eight outstanding students from across the state to be invited to exhibit his System Engineering project from 2018. He successfully designed and built a Robotic Mopping Machine for his client which met all of their needs, as set out in the Design Brief. His project encompassed a range of different production techniques from fibre-glassing and painting through to 3D printing using rubberised filament. As part of the criteria he had to satisfy, Will had to integrate both mechanical and electrical systems in his project. He had to use the Engineering Design process to come up with innovative solutions to his project and develop a working document containing sketches, parts, risk assessments and a timeline and materials list. All of his thoughts, ideas and processes had to be documented in a folio which will also be exhibited in conjunction with his device. “Will’s project is the culmination of many hours put in at both home and school. He showed a steely determination to succeed in creating his project and despite several setbacks was able to create what he wanted, even if blowing up a vital piece of electronics was not part of the plan! He was an excellent student to have in the class and was able to assist others with technical problems that they encountered. The willingness to help was wonderful to see. He also acted with great integrity when complex situations arose within the class. It was a privilege teaching Will over the past few years. If you are in Melbourne between 30 March and 14 July, pop in to the Melbourne Museum, Carlton to view Will’s piece and the work of other top students across the state. A full list of the students exhibiting their works is available for download on the VCAA website. Top Designs is part of the VCE Season of Excellence managed by Victorian Curriculum and Assessment Authority. The VCE Season of Excellence comprises twelve concerts (Top Class and Top Acts), two exhibitions (Top Arts and Top Designs), eighteen screenings of short films (Top Screen), and a new research presentation event (Top Talks). All work is produced by outstanding VCE students who completed technology, research, design, visual arts and performing arts studies in 2018. Events are presented in Melbourne’s major cultural venues, and a number of associated education programs are offered in conjunction with Season events.